Patients who are considering taking the drug Toviaz may have questions about what potential side effects mean for them. Most Toviaz side effects are generally mild and may include constipation, dry eyes or dry mouth. People who are taking Toviaz, or considering Toviaz treatment, should also be mindful of serious, but uncommon, side effects such as hallucinations, confusion and disorientation. Because Toviaz can also cause blurred vision, dizziness and drowsiness, patients should assess the effects of the medication before driving a vehicle or operating heavy machinery. If these side effects are persistent or serious, your doctor may recommend a different course of treatment. In most cases, common Toviaz side effects are not severe enough to warrant the discontinuation of treatment. Side effects such as dry mouth and dry throat may be alleviated with water or lozenges, and patients can use over-the-counter eye drops to make the dryness associated with Toviaz less bothersome. Toviaz may pose specific dangers for elderly patients. This is because elderly patients are often more sensitive to the effects of the drug, which increases their risk of developing Toviaz side effects such as urinary tract infections, urine retention, severe constipation, dry mouth, indigestion, heartburn and dizziness. Elderly patients who are using Toviaz to treat their overactive bladder syndrome may require more frequent checkups and more extensive monitoring than younger patients. At-risk patients must make sure to keep all appointments with their doctor while taking Toviaz. Toviaz may not be a suitable treatment option for overactive bladder syndrome patients that also suffer from glaucoma, delayed emptying of the stomach, liver disease or kidney disease. It is very important to let your doctor know if you have myasthenia gravis, a rare disease that causes severe muscle weakness. Any of these conditions may increase your risk for developing Toviaz side effects. Your doctor will thoroughly examine your medical history before prescribing Toviaz to avoid potential interactions or side effects. There are a few things that patients can do to minimize or avoid uncomfortable, or potentially dangerous, side effects associated with Toviaz. 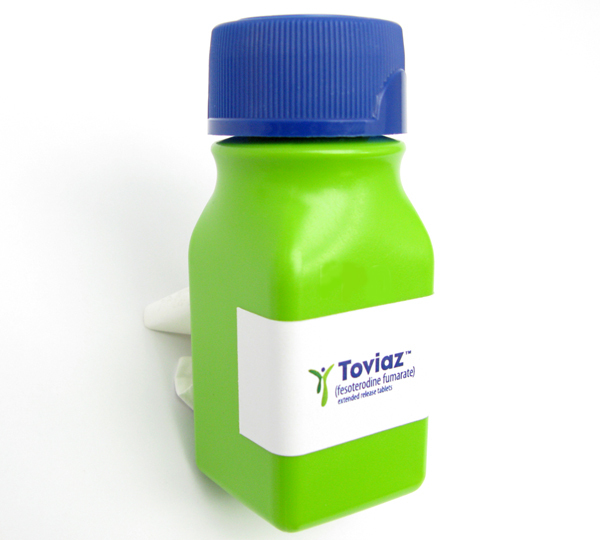 Patients are cautioned against performing rigorous outdoor activities in warm weather, as Toviaz users may be more susceptible to heat exhaustion. Doctors also suggest maintaining proper dental hygiene, drinking plenty of fluids, and using sugar-free gum or hard candy to minimize thirst and dry mouth. Patients who are suffering from overactive bladder syndrome should talk to their doctor about Toviaz. Only your doctor will be able to assess your particular needs to determine if Toviaz will be a safe and effective treatment for you. It is important to keep in mind that many patients use Toviaz with little, or no, side effects at all. The most common side effects that do occasionally occur are generally more of a nuisance than a cause for alarm. Consult your doctor or pharmacist for more information on Toviaz and its side effects.